Great service and healthy plant. Would buy again. I put my Callicarpa into a pot. 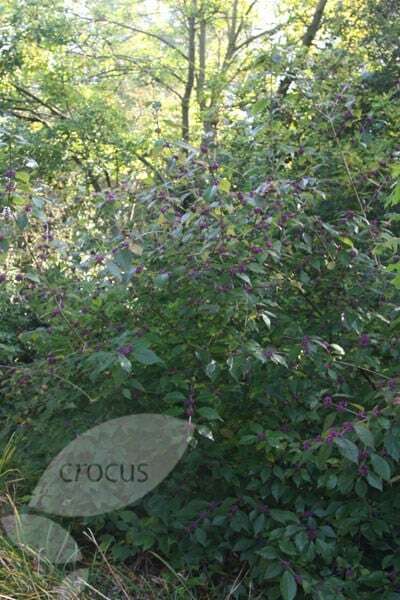 It has grown well and was covered with purple berries until found by the birds during a cold spell. I've had a garden for over 30 years so not really a beginner but not avid either. I planted this for the berries in autumn 2016, it has grown well, but I've not seen much in the way of flowers and no berries. The soil is good, plenty of organic, and doesn't dry out as it's covered with weed mat and stones. Is in a south facing border, gets plenty of sun in summer, but none in late autumn/winter. Bit disappointed really as I put it opposite the patio doors for impact. Was brought as a present. The recipient was thrilled to bits with it. Brought this a few weeks ago and it has already taken well to the garden. Leaves are starting to come out now. Can not wait to see the flowers and the main reason I brought it the berries!! It needs a sunny position (South facing) and lightly acid, well drained soil to do well. It will grow in light shade but it will not produce many berries. It is rather plain until the berries form and is, in my opinion, best grown as part of a shrub border where winter greens, reds and whites would compliment the beauty of the berries that sadly, at least in my garden, do not last long as blackbirds adore them. Planted in garden, but both now appear to be dead. a great late bit of colour. Will be quite impressive once mature. I saw this shrub in a friend's garden and fell in love with it. The berries are a gorgeous colour and in winter as a bonus. However, my garden is on the seashore and strong winds scorched the leaves and the flowers didn't set berries (except two berries at the very bottom}. So I have moved the plant to a more sheltered place and am hopeful for next year. I have been told that Callicarpa needs to be bought in twos or threes to ensure plenty of berries. Is this the case? Hello Although this plant doesn't need a pollinating partner if planted in groups you will usually have more berries. I've just received my callicarpa (12l pot) and am struggling to find any advice as to when would be best to transfer it into the ground. I'm in the North East- will it cope with being planted out now in January or should I leave it outside in its pot until later in the year? 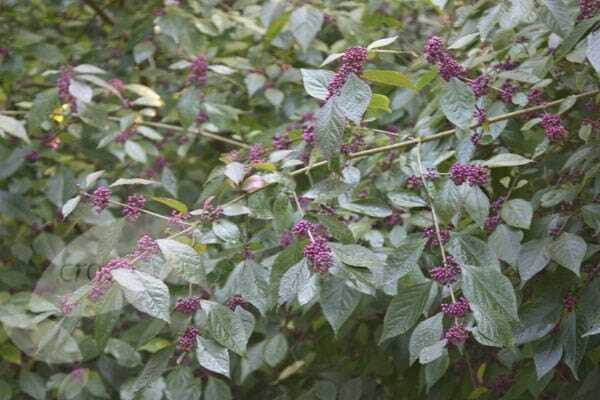 Why does our Callicarpa bodinieri giraldii fail to produce berries? Hello, This could be caused by a number of things, but the most likely are either not enough sun, water or the right kind of fertiliser - which would ideally be a good multipurpose one that contains potash. I live in the eastern edge of the West Midlands - do you think I could grow a Callicapa against an east north east facing fence? Hello there We wouldn't recommend this for an east facing aspect,- normally only south or west facing. Sorry. Hello. I live in East Scotland and keep a beauty berry plant inside in my house extension. It has been there for three years but has hardly grown and does not look very happy. It is in full sunlight, regularly watered and fed bio care. Would the plant be happier outside where our temperature can drop very seriously in our winter ? If not, is there anything else I can do to help it inside ? Thank you. Jimmy. 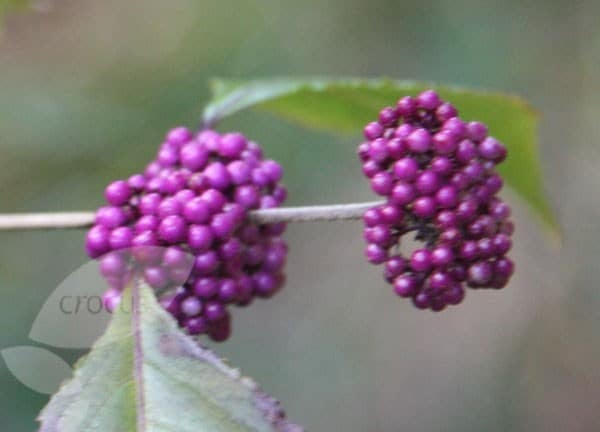 Hello, If you have this particular Callicarpa, then it is classified by the RHS as being ''Hardy in most places throughout the UK even in severe winters (-15 to -10)''. I ahve never heard of these being grown as indoor plants, although I do know that some of the other callicarpas are not quite as hardy as this one. I would definitely advise planting this one outside though, as it certainly wont thrive inside - in fact I think you have done remarkably well managing to keep it alive for so long! Hello, There are a number of reasons why plants do not flower - or go on to produce berries. The most likely reasons are not enough sun, pruning at the wrong time of the year, or insufficient water and nutrients. You can however give it a bit of a push in the right direction by feeding it with Sulphate of Potash, following the instructions on the packet.